Most climbers view hiking as an interaction between man and nature. In Mt. Iglit, this interaction is added with extra dimensions for it is also home to the Mangyan tribesfolk, and the habitat of the endangered tamaraw. Indeed, aside from the summit assault which is quite challenging, a chance to encounter our ethnic brothers, free from the dilution of modern culture, is a unique experience. They, after all, are the real mountaineers – they live with the mountain and understand it more than we do. Until 2007, they continue to wear their traditional ‘bahag’ (loincloth) costume, although some have added a modern touch to it – wearing briefs instead. Then, there is a chance to see tamaraw in the wild. These beasts, like their carabao cousins, love to roam on grasslands; but hunting and habitat destruction have pushed them up to the mountains. Sadly, the chance to see them is getting slimmer and slimmer as their numbers dwindle. As of the last count, which the author of this itinerary witnessed, only 500 tamaraw remain in the wild. They can be best viewed in Mt. Magawang, which is part of Iglit. DENR officials in Mindoro call on mountaineers to help save the tamaraw by publicizing this advocacy. A major attraction of Mt. 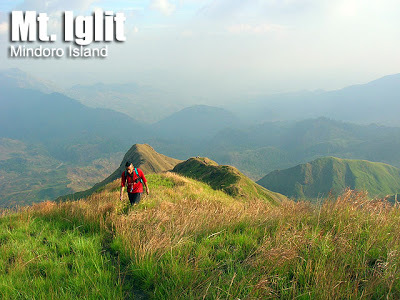 Iglit, of course, is the hiking experience. During the summer months the temperature is unbearably hot. But once you reach Station 2, the temperature is cooler. The rangers there plant a variety of fruit trees. The ascent, as mentioned, is challenging. The trails are very steep (50-60 degrees) and loose rocks would just fall off. 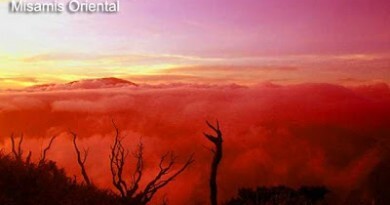 At the peak, however, you can see Mt. Baco and the surrounding mountains; as well as the northern part of Sulu Sea; even Apo Reef – a tiny speck in the ocean. The dramatic, dangerously-narrow Mangibok ridge which you have to pass before the summit is a ‘danger zone’ and a landscape of grand proportions; it is the highlight of the Iglit climbing experience. From San Jose, Occ. Mindoro: you may take an airplane to San Jose from Manila, or a ferry. Alternatively you can take the long way: Manila – Batangas Pier (3 hours); Batangas Pier – Abra de Ilog (2.5 hours) then 5-hr bus to San Jose. For this long way the total cost is around P500 one way. Secure permit from the DENR office in San Jose, Occ. Mindoro. Buy supplies. You may visit White Island or the nearby beaches also. 0500 ETA Basketball Court; courtesy call to Brgy. Officials. 1130 ETA Station 2. Lunch break. 1930 Back to Station 2, set up camp. 1130 ETA Mt. Magawang (Station 3). Set up camp. Access to Mt. Iglit is admittedly difficult. To maximize your travel time and expense, you may opt to visit the famous Apo Reef, or explore the other mountains in Mindoro. Take note that Mt. Halcon is closed at least until 2009. Mt. 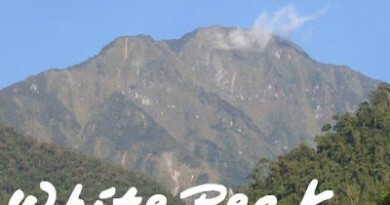 Baco is another possible destination but there is little information on how to climb this mountain. 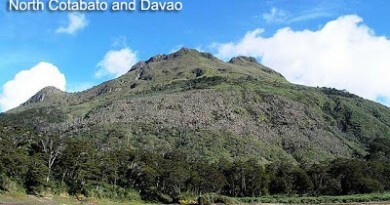 It is advisable to make contact with the DENR first before attempting any climb to Mt. Iglit. Sometimes, too, they ‘close’ the mountain when a tamaraw count is being done. The presence of NPA can still be felt in Mt. Iglit, with forest rangers recalling their encounters. However, the DENR would be in a position to advise you if it is dangerous to go, so securing their permission is a must. Mt. Iglit is known to the Mangyans as Mt. Mangibok, which means ‘Steep Mountain’. It is so steep and dangerous that several lives have been claimed: one, a researcher, fell from the ridge. This native name is used in this guide as the name of the steep, narrow ridge that leads to the summit. Propelled perhaps by an interest in their school symbol, the tamaraw, mountaineers from FEU are among the first to climb Mt. Iglit. 25 Comments on "Mt. Iglit (1,432+)"
Good day, Nag paplan kami mag climb this april 2016 mt iglit travers. Jumpoff sa brgy malpalon travers sa brgy poypoy..
planning to climb Mt. Iglit before end of this year. 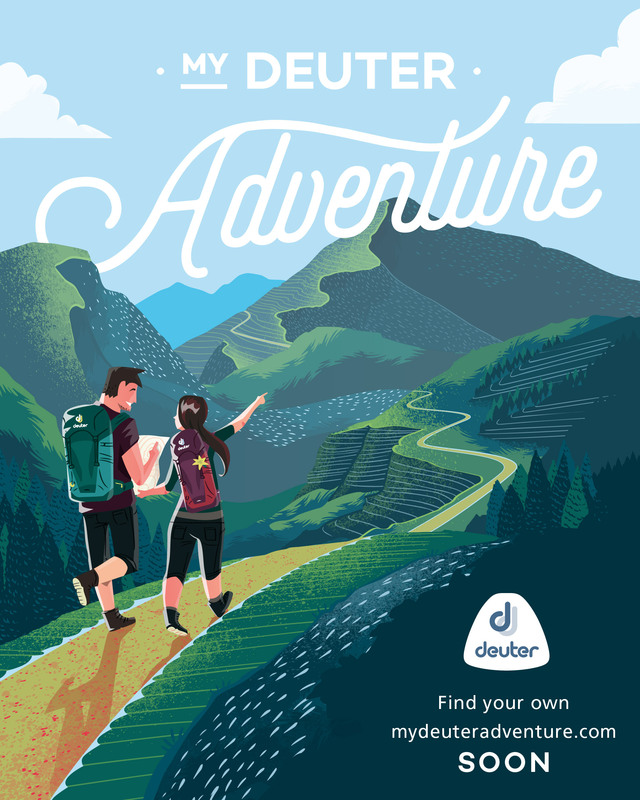 Any contact number of a guide?